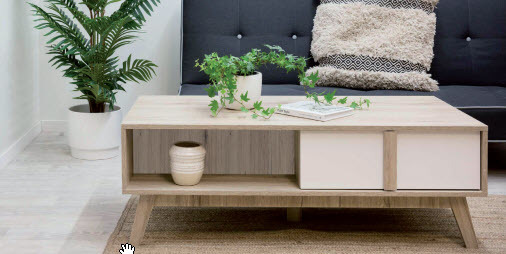 Coffee tables are staple pieces that tend to pull furniture design together to complete one pretty picture in the home. It’s also where many conversations take place whilst families and friends sip their hot brews and put down their cups in between laughter. Some people decorate their centre and side-tables with plants and little ornate trinkets while others leave books, magazines and candles on display. Coffee tables have a unique place in the heart of a living room and there are endless table trends that can be snapped up. However, tables vary in materials, size and shapes … so what’s the best look and feel for your home? Carol Sukkar from Home and Soul Dubai shared her top tips with InteriorsWeekly on how to select a dream piece of furniture. - Is it a match? A marble coffee table will fit into almost any living room and bring a light, laid-back almost any living room. The gold finishing will help give the dining area a regal and polished look. Interior designers also suggest oxidised oak, which is a blackened version of tried and true white oak, for its grounding and comforting properties. Glass coffee tables still look pretty and help make a room look bigger. However, from experience, it can be a dust magnet. Curved coffee tables in different geometric forms are also appealing as they stand out like works of art. Don’t be afraid to mix and match or purchase a set of three in different sizes.